Providing three meals a day for your family is a lot of work. It’s time-consuming, costly, and labor intensive. That’s why I was thrilled when I heard about food delivery services that shipped fresh produce and meat to your doorstep. As a mom myself, I often take at least three trips to the grocery store a week. Limited time to schedule forces me to take a trip for almost every meal my family has to eat. On days where there is no time to shop and prepare food, I just order delivery from restaurants. Having a picky two-year-old and a foodie husband who hates eating the same thing twice in a row makes things even harder. To see if saving time, money, and hassle was possible, I tested various meal delivery services. Here are the top delivery service kits for moms, with details covering the costs involved, meal experience, and suitability for families. I tried four different family plan recipes from Blue Apron. It was the first food delivery kit that arrived at my doorstep, so I wasn’t sure what to expect. I found the service to be a great way to introduce different foods to my family. Their curiosity of each recipe made the experience an interactive one for the whole family. Running errands or taking my son to classes, it takes a lot of moving parts and rescheduling to be able to stay at home to receive packages. Luckily, all the food delivery services just drop the boxes off by the front door and don’t require a signature upon receipt. 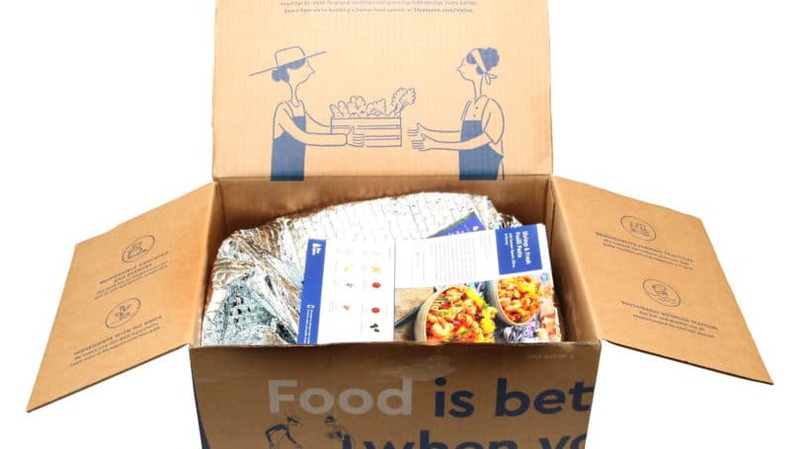 The four meals sent by Blue Apron arrived in two large boxes, each insulated and packed with ice to preserve the produce. The ice packs and meat were strategically placed on the bottom of the box, while the fresh produce and sauces were situated on top. Plastic air bags consumed the empty spaces inside the box to prevent the ingredients from being displaced. This allowed the vegetables and cheese to remain fresh and cool, while the meats remained cold during shipping. Each meal came with instructions, the necessary ingredients, suggested cooking times, and recommended wine pairings.The instructions were relatively easy to understand and follow. The meals were also delicious, making them a hit with my family. One cumbersome task that I came across, however, was having to grate an entire apple for one recipe, and an entire block of cheese for another. Grating is time-consuming and not the safest tool to have around children, so I did find myself wishing there was a better way. Customer service was impressive. I found that Blue Apron by far had the best customer service. Due to a massive snowstorm, my delivery was rescheduled and then delayed. Customer service was communicative the entire process and was adamant about sending a new box immediately if the ingredients were not still fresh. Meals had plenty of variety. The meals I received were a mixed variety, each unique from the other: Pork Chops & Miso Butter, Vegetable Chili & Baked Sweet Potatoes, Verjus-Braised Chicken, and Salmon Piccata. Blue Apron incorporated different meats, starches, and distinctive flavors between each meal which prevented redundancy. Quality ingredients created a tasty meal. Overall the meals turned out delicious. The family favorite was the Salmon Piccata. Some cooking tasks were difficult. As mentioned earlier, this was time-consuming and difficult for me to do with a toddler around. Plenty of waste needs to be disposed. The boxes, ice packs, insulators, and wrappers take up a lot of space. It wasn’t a big deal, but it was a nuisance since my kitchen area isn’t that big. Just be mindful of this and have a space to store everything until the garbage trucks come. Special Note: They send a free apron with your first delivery. HelloFresh sent me three family plan recipes. It was the second delivery that arrived at my door, and in many ways, it was comparable to Blue Apron. The meal kits arrived in a large box, packed with ice packs and wrapped with an insulator. It was comparable to other services and kept the food fresh and safe until I picked it up. Each meal came with a recipe card with photos that showed all the ingredients you will need along with step by step instructions. They even note the steps where children can assist with the cooking. I found the specific meals that were sent to be one of the easier dishes to whip up from all the food delivery services. Meals provided a variety of tastes and techniques. HelloFresh sent a Hearty Beef Stew Over Barley, Chicken Pineapple Tacos, and a One-Pot Sausage and Tortellini Soup. I appreciated the fact that each meal had contrasting manners of eating. The tacos were eaten by hand, the soup slurped from the bowl or imbibed with a spoon, and the stew eaten with a fork. Different methods stimulate sensors in a child’s brain and help develop fine motor skills. It doesn’t hurt to encourage learning even during meal time. Both the meals and preparation were kid-friendly. Besides being one of the easier dishes to whip up, Hello Fresh was the most liked by my son. Please note that this is mainly due to the fact that the menu consisted of items such as beef stew and tacos – universally simple and beloved dishes. Either way, they were nutritious meals that left my family happily fed which is all a mom can ask for in a meal. Plan for garbage and recycling. Like other food services, such as Blue Apron, HelloFresh’s packaging took up a lot of room in my small kitchen. Again, it wasn’t a big deal but something customers may want to preplan for. Menu Plan: Omnivore, Carnivore, Gluten Free, Vegan, Paleo, Vegetarian, Two Person or Family Plan. Special Note: Everything is organic. Green Chef was my personal favorite due to quality and taste. Knowing that all the ingredients were organic and from local farms alleviated any concern I had about the elements. Like other services, Green Chef’s ingredients arrived in a large box packed with ice and insulation to preserve the fresh ingredients. I had no issues with the well-designed packaging and presentation. Instruction cards with photos of each step was sent with the ingredients. Although steeper in price and requiring more techniques to create their meals, the taste was more sophisticated and epicurean. My husband agreed. The only difficulties I had with Green Chef was that it took an hour to prepare each meal and the palette was a little too sophisticated for my two-year-old son. He didn’t appreciate the different flavors on his plate, but going forward, I would just modify his portion to appease him. An all-organic service. Because all the ingredients are organic, Green Chef is situated at a higher price point than Blue Apron or Hello Fresh. 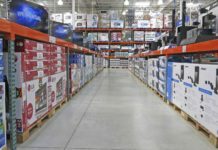 However, according to their website, cooking a recipe with Green Chef was on average over 46% cheaper than shopping at Whole Foods across several cities. This even includes shipping costs. Customers are able to spend less by only receiving exactly what is needed per meal. Tasty meals make for a happy family. Green Chef wins the taste test across the board between all the food delivery services. I had the Hawaiian Fried Rice and the Chicken Garbanzo Bowl. The flavors were rich yet delightful. Price is higher than the competition. The cost of Green Chef is justifiable for their niche, but it is understandably not the most cost effective meal kit service. For those on a tighter budget, Blue Apron or Hello Fresh may be a reasonably economical choice. Required cooking times are also elevated. Green Chef takes an hour to prepare and plate. It doesn’t require you to do anything more difficult than the other companies, but I know even 15 extra minutes is a long time for a busy mom. It is imperative to note the logic of why it takes longer, however, as the enhanced flavor and taste is the result. It’s because there are more steps where ingredients need to be cooked individually or differently, as opposed to the other meal services whom mostly require only a pot/pan for all the recipes. Special Note: Terra’s Kitchen is the only meal kit delivery service that isn’t subscription or membership based. You do not have to cancel at any point since there is no commitment. Terra’s Kitchen sent four two-person plan meals, all of which I was able to pick myself. Unlike the other Meal Kits that come with limited menu options per week, Terra’s Kitchen offers about 53 options. This is a great factor for a mom like me who has to satisfy the taste buds of different people and are not confined to options that won’t work. Terra’s Kitchen sends their meals in a reusable container consisting of shelves. Each shelf is methodically occupied by the ingredients for an individual meal. Upon emptying the container into your fridge, you simply need to place the reusable container back on your front porch or door and someone picks it up the next day. This saves a lot on waste and packaging. Terra’s Kitchen was overall my family’s favorite pick. For this busy mom, I found it to be the most effortless to prepare since most of the produce arrived chopped. This means dangerous kitchen tools are not required, and children can aid in the preparation of their own meal. And for customers like my husband who enjoy a cold glass of beer with dinner, they provide beer pairing options as well as wine. Lastly, there is a section called “TK Table Talk” with every recipe card which presents a question that you can ask to start a conversation over dinner. The details were thought out and made a simple dinner seem more like a dinner party. Simple preparation. As mentioned above, Terra’s Kitchen sends everything pre-chopped. Every meal takes only about 15 minutes because the prep work has been eliminated. Ample variety of meals. Because I got to pick all the meals that I wanted to prepare from a list of 53 options, I didn’t have to worry about my son or husband’s dissatisfaction. It gave me control of what was being fed to my family and the guarantee that they would enjoy the meals. Impressive taste. The meals I picked from Terra’s Kitchen were: Moroccan Chicken Tagine, Salmon Tostadas with Avocado-Orange Salsa, Barbacoa Street Tacos, Mexican Chicken Chili. They were all distinctively savory and delectable. We were left wishing there was more to eat at the end of each meal. Free snacks are included. Terra’s Kitchen sent over a small package of grapes, cheese, and crackers. My son had fun snacking while I quickly organized the fridge with the newly delivered ingredients and prepared dinner. Customer service is lacking. Terra’s Kitchen’s delivery was affected by the blizzard as well. 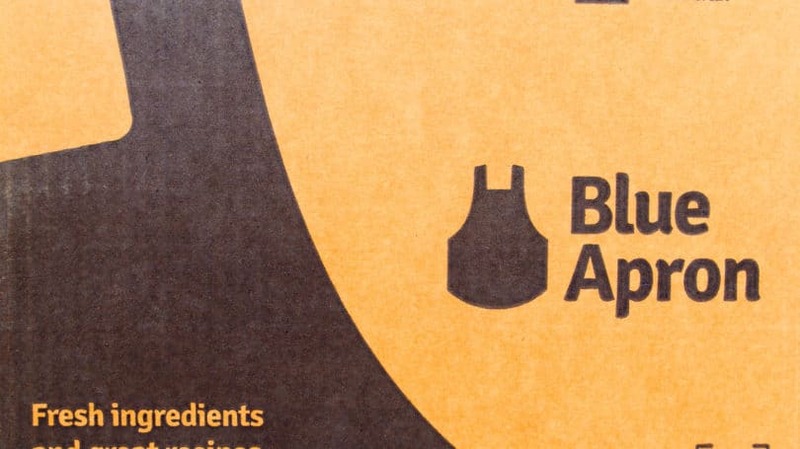 Unlike Blue Apron’s immediate response and concern, Terra’s Kitchen was slow to react. They couldn’t track the package that was sent for more than five days. They only arrived at the conclusion that I should be sent a new package after I questioned the freshness of the ingredients being missing/late for so long. However, due to the snow storm and the many deliveries it has affected, I can understand one hiccup and would give them another chance as they were our favorite meal delivery kit. Special Note: Munchery hand deliveries your meal as long as you are within their designated perimeter. They send the name and photo of the person who will be delivering your meals. 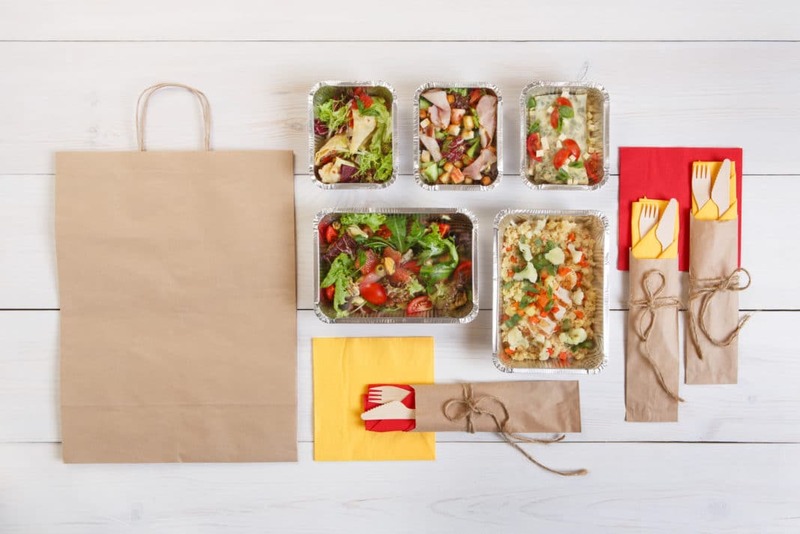 Unlike the other delivery services on this list that send kits consisting of ingredients and a recipe card, Munchery delivers premade meals to your doorstep. As long as you order by 1pm, Munchery hand delivers your dinner by 6pm. It’s an acceptable option for those looking for a quick, healthy, and inexpensive dinner. They also provide a kid’s menu, which my son enjoyed. However, the kid’s menu is limited to two options and doesn’t frequently change. Zero preparation. No cooking is involved at all. They hand deliver your dinner to you. Healthy options. Their options are all healthy so you know exactly what’s going into your body unlike ordering from local restaurants. Free cookie. Who doesn’t want a surprise cookie with their meal? It was a pleasant surprise that I thoroughly enjoyed. Limited delivery availability. As of now, Munchery is not available nationwide, but only to a select region. You can check their website to see if they deliver to your area. Taste is subpar. As a family, we tried Tri-Tip Steak, Pork Ragout, and Kids’ Drumsticks and Broccoli. Everything seemed to be a tad bit salty. I’m not sure why, but each of the meals including the kids’ meals seemed to have too much salt. This, however, was only the opinion of my family. Others might have thought it was fine. The meal kits listed here are all great options to save time, money, and provide nutritious meals for your family. In addition to the ease and convenience they provide, many offer options that are healthy for both you and the earth by establishing long-term relationships with local, ethical farms. Have you tried any meal delivery services? What are your favorites? Yoojin Lee graduated from NYU with a background in business and worked in the fashion industry for almost a decade before becoming a mom to son, Theodore. Instead of labeling herself as a "stay at home mom," she utilizes her education, experience, and skill sets to learn how to be a resourceful mother and wife while striving to pave a career for herself as well.